To impress a movie star, a U.S. Air Force crewman pretends he is soon to see combat. When his lie gets out, chaos ensues. Tom Fletcher: [after auditioning a song] How'd you like it, sir? Elwin 'Bix' Bixby: Um. Wouldn't hiss and wouldn't cheer. 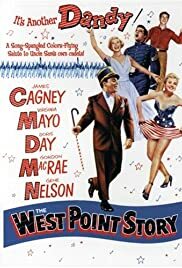 James Cagney stars in a not very good musical that is set at West Point. James Cagney is good as usual but the script isn't very good. Doris Day is Ok but she was better in Young man with a horn. Virginia Mayo is gorgeous and the best thing in the movie.